Located in the foothills of the Olympic Mountains, the park features spectacular views of the snow-capped peaks. The first development on the lake was the Rose Farm and later the Antlers Hotel, constructed in 1895. In 1920, the City of Tacoma was granted a lease to construct a dam for the purpose of generating power. The dam was completed in 1926. 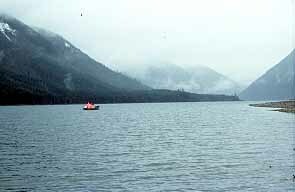 The lake was named in honor of Orrington Cushman, nicknamed "Devil Cush," interpreter with Governor Issac Stevens when Indian treaties were being made. The park features picnicking, boating, water skiing, hiking, camping and fishing.